Finding ways of sharing and promoting my ever growing Around the Hat photo series has become a focus of mine for 2013. The response and viewership has been really exciting to witness, and in addition to the new photo sets I have in the pipeline, I thought creating postcards from my 1000+ image series would be an affordable and easy-to-share way of keeping some of the momentum going. First off, I want to emphasize that this is going to be a very limited run. The quality of postcards I'm releasing aren't that cheap to produce, but there's really no value in doing this half-assed. I figure those who are actually interested in buying a few of my postcards will appreciate the exceptional quality, and will recognize the time I put into their production. I have to admit that this is mostly a cover-my-costs way of promoting the series and having a few of my images circulating outside of this blog. For starters anyway. The postcards are being printed on premium cardstock (350gsm/130lb paper) with a laminate gloss on the image side, which will give them a really nice weight, and a professional look and feel. They'll be ideal for mailing or framing, and in addition to the traditional postcard backing, they will also feature a little blurb about the series and it's relation to Medicine Hat. What I really like about the postcards is that they're essentially 4x6 inch art prints. The fact that they feature Medicine Hat scenes is really a bonus in some ways, as I think most people will simply appreciate the style and detail of the photography even if they're not familiar with the city. Even just as stationery they're a beautiful product. That said, I think they'll make really cool souvenirs and will feature everything from the clay district to the teepee to the details of lesser known locations. If you know this city as well as I do, I doubt you've ever seen postcards of this quality produced for Medicine Hat. I think that's kind of awesome. 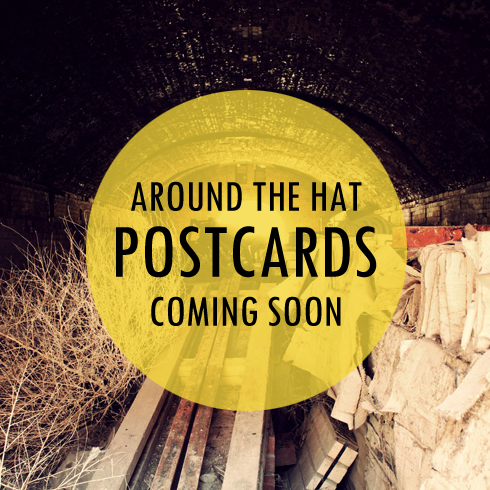 The first run of postcards will showcase 40 of my favorite Around the Hat images, but again, in a very limited supply of only a few prints per image. Expect them to sell for a few dollars each. Stay tuned for the unveiling in a few short weeks when I list them here on Editing Luke. I have always loved browsing your post card. Your designs are amazing.The graphics on them are noticeable and admirable too.